Summary: Gold has zero yield and is expensive to hold. Summary: Gold as a security asset is the equivalent of a can of beans. Summary: Gold is a dud investment in AUD terms taking into account yield and cost to hold. Summary: Republicans are freaks (or perhaps just those advocating a Gold standard?). Gold standard is equivalent of burning witches. A soya bean standard would be better. Gold is like every other commodity. Summary: Gold has no fundamental basis as a store of wealth. Summary: Moving to a Gold standard will not solve any fundamental problems. Summary: Gold a bubble. Iron ore rises 60% in a couple of months and no mention of bubble. Summary: Gold is in a bubble because it's sold out of vending machines. So let's take a look at these sound bites one by one. Gold has zero yield and is expensive to hold. Well from a personal investment perspective Koukoulas is correct, Gold doesn't pay a yield if you buy and hold the physical metal. At least not in Australia. Up until recently those depositing Gold with banks in Vietnam were paid interest, however that has recently changed. Central Banks and institutional Gold owners may be able to lease their holdings for a small return (Gold Lease Rate). Last financial year the RBA returned approximately $200k from leasing Gold, however they don't advise the cost to store it with Bank of England (99.9% of Australia's Gold stored with the Bank of England is a story I broke a week ago). As for expensive to hold... that is debatable as it depends on whether you want to hold and store the metal yourself and cost may vary depending on scale and investment size. Someone with only a small amount of Gold may feel comfortable holding it at their home and it may be covered under their contents insurance (e.g. CGU covers cash & bullion up to $1500). Assuming we are talking a larger (investment sized) amount, safety deposit boxes with local banks can be rented for various prices, some for as little as $15-20 per month could store half a million in Gold bars quite easily (+ insurance on top if you want). Alternatively various storage options are available with bullion dealers these days at low cost, for example Bullion Money's basic allocated storage is $11 per ounce per year, this works out to around 0.7% holding cost per year with Gold at AUD$1600. It's not a lot to spend for peace of mind. Last I checked my superannuation account was hitting my pocket for more than this in fees when they don't even manage my allocations (most invested in direct equities). 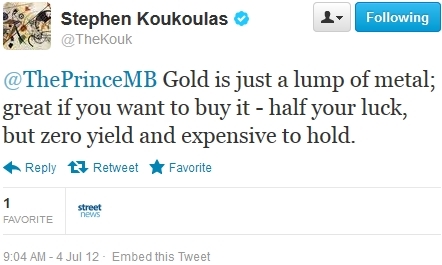 So if Koukoulas thinks that Gold is "expensive to hold", perhaps he can clarify, in comparison to what? Gold as a security asset is the equivalent of a can of beans. 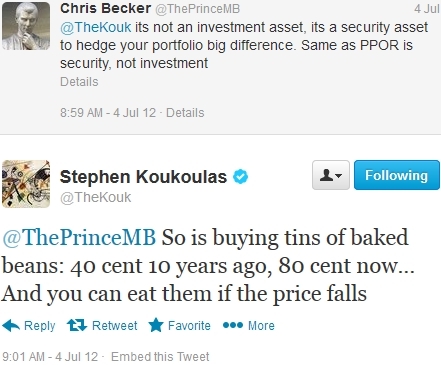 When Chris Becker (The Prince from Macro Business) suggested Gold was a security asset, Koukoulas said so is a can of beans which has doubled in price over the last 10 years. He then suggests that you could eat them if the price goes down. I think Koukoulas misunderstood what Becker meant by a security asset, in a past post this was the explanation provided: I treat physical gold as a “Type Zero” security asset, a small insurance hedge against financial instability – a “Minsky Metal”. Do beans rise in value during periods of financial instability? Probably only in the case we saw a complete melt down of the financial system, resulting in a breakdown of society. If we could get everyone in the West to vote in this poll, I think "gold is an investment" would win in a landslide. If we could get everyone in the precious metals blogosphere to vote, then "gold is money" would probably win. So, to most Westerners, gold is an investment. To the gold bugs and HMS crowd, gold is money. And to the bullion banks, gold is a currency (ISO code XAU) upon which credit is issued and traded. So what did A/FOA mean by the statement that gold is wealth, not any of these other things? I mean, surely gold is whatever its users think it is, subjective use value and all, right? 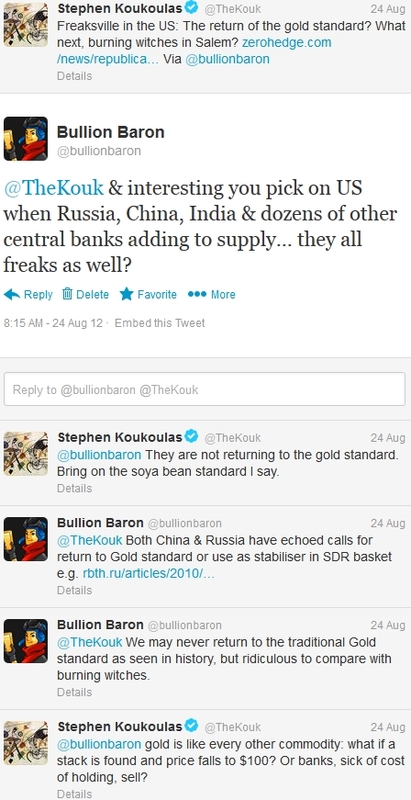 Not all buyers/holders of Gold are holding it as the end of world apocalypse ticket that Koukoulas seems to imply in his comments. Gold is a dud investment in AUD terms taking into account yield and cost to hold. Hmmm... Gold priced in AUD is a dud investment? Over what time frame? Over 3, 5 or 10 year periods Gold has performed exceptionally well, priced in Australian Dollars and basically any other currency. Granted it has performed better in USD and some other currencies than in the AUD, but a 10.9% annual return over 10 years is nothing to sneeze at. Even if we threw in a cost to hold at 0.7% (tax deductible) it's still a great return and comes with taxation advantages that put it ahead of cash (50% CGT discount if held longer than 12 months). Koukoulas, please explain? Republicans are freaks (or perhaps just those advocating a Gold standard?). Gold standard is equivalent of burning witches. A soya bean standard would be better. Gold is like every other commodity. Koukoulas likes to complain when others use labels or names, but he seems to do it quite regularly with the Gold crowd (and for other "fringe" groups such as the Tea Party movement), calling them "freaks" and "loonies". I'm not sure what he meant by equivalent to burning witches, but I assume he simply meant that it was an outdated practice with no relevance in today's modern society. Those advocating a return to sound money are generally just looking for monetary policy which is based on a stable and sustainable foundation. Gold is not a perfect solution, but if it had continued post 1971 it's likely to have restricted governments from running massive budgets deficits, which has (several decades later) resulted in many countries with unsustainable debt to GDP levels. It's scary that suggesting we return to sound monetary policy today is compared by Keynesian economists such as Koukoulas to burning witches, rather they would prefer to have the same men and policies that got us into this mess try and get us out. 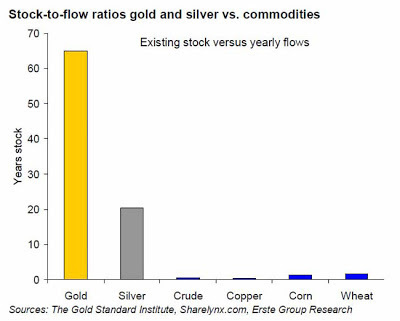 Gold is like every other commodity? I think not. It's Golds unique properties which have seen it used as money or a store of value for thousands of years, it's durable, divisible, consistent, convenient, and has value in and of itself. Of course there are other difference as well, but this post is starting to turn from long post into thesis in size. 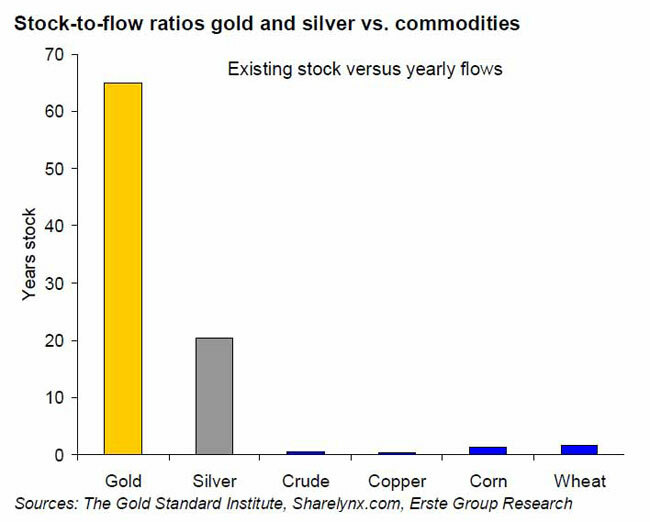 Bottom line is that suggesting Gold is the same as other commodities is showing ignorance of facts and history. Gold has no fundamental basis as a store of wealth. A gold reserve is the gold held by a central bank or nation intended as a store of value and as a guarantee to redeem promises to pay depositors, note holders (e.g., paper money), or trading peers, or to secure a currency. 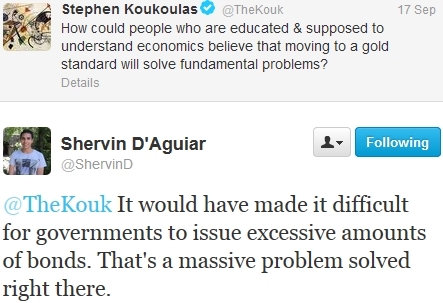 Perhaps Koukoulas could provide an example of ANY other asset which transcends both time and geographical location as a store of value in the same way that Gold has and does? Moving to a Gold standard will not solve any fundamental problems. Gold a bubble. Iron ore rises 60% in a couple of months and no mention of bubble. As an asset with no yield it becomes difficult to substantiate whether Gold is over, under or fairly valued at any one point in time (in hindsight one can draw a conclusion from what the price has done, e.g. 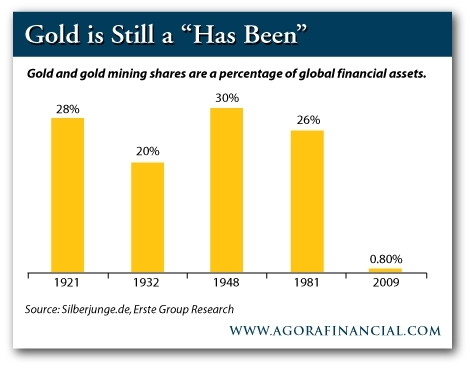 Gold in 1980 was clearly a bubble, which was made obvious after the peak when it collapsed roughly 50% in 3 months). One of the valuation methods I have used on this blog is comparing it in a ratio with other assets, such as to oil, houses or stocks. Another interesting measurement is to compare an ounce of Gold with Australia's weekly wage, which results in a ratio today around middle of the road. Mr Holland said industry cash costs in Australia were about $US800 to $US850 an ounce, which was 20 per cent to 25 per cent higher than the average across the global gold industry. Gold is in a bubble because it's sold out of vending machines. Anecdotal increases in Gold's visibility to the public can point toward a bubble like mentality, but is the Gold vending machine really anything more than a convenient (albeit expensive) way to buy Gold? By the same logic should we make the presumption that stocks are in a bubble because I can buy them via an App on my mobile phone? Or cash is in a bubble because I can draw it out of an automatic teller machine in a similar way to drawing Gold out of a vending machine? These are extraordinary changes. They reinforce the scenario that in the next 10 to 20 years, trends on the Shanghai or Mumbai stock exchanges will be as important, if not more important, that what happens on Wall Street. It means that in the not-too-distant future, policy changes in Indonesia will be more important that in the UK, France and even Germany. As a demonstration of the rising living standards and the closing of the gap between developing and developed countries, the OECD estimates that average GDP per capita will grow by around 3 per cent per annum over the next 50 years, a stark outperformance relative to the average 1.7 per cent in the OECD area. It is Asia, so very clearly, where Australia needs to maintain and build its economic, investment and cultural engagement. It seems so obvious. So why shouldn't the west also warm to the importance that China, India, Russia and other countries place in Gold? 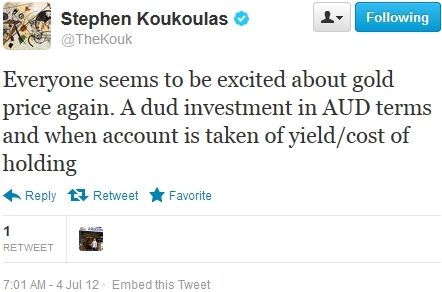 That is assuming he was looking to take this approach himself as well as hold others to the same account... that's a good New Years resolution that @TheKouk will be sticking with, I look forward to this as well as his comeback post on why Gold is in a bubble at $1665. Pascometer: Contrarian Indicator Rings "Buy Gold"